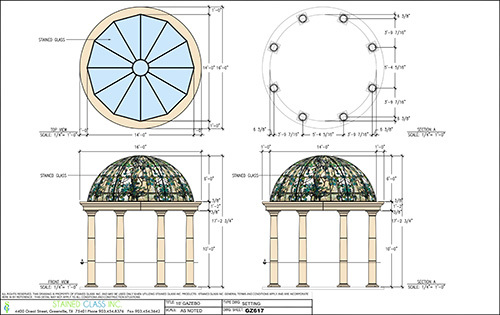 Make a Stained Glass Inc. gazebo or stained glass ceiling the focal point of your landscape. Add drama to the outdoors with a beautiful, durable stained glass gazebo. Here at Stained Glass Inc. we supply beautiful gazebos with unique stained glass rooftops. 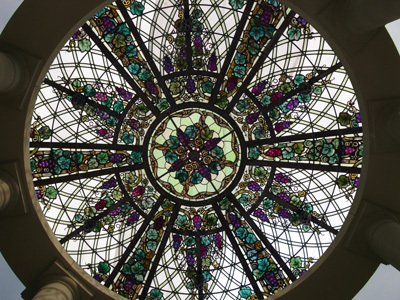 Our talented team of artisans creates customized stained glass domes for a beautiful and elegant look. The eye catching addition of stained glass will not only enhance your gazebo's overall aesthetics, it will also allow sunlight to softly stream through without any unpleasant glares. Each of our gazebos features the finest stained glass designs, richly colored and elaborately patterned with the option to have your design fully customized. Additionally, all of our designs are made from shatter-resistant polymer glass, the same material used in bullet proof glass, so they are safe from hailstones or golf balls. Stained glass gazebos would be perfect to use in an outdoor wedding or other outdoor parties and events, or one would look stunning in your backyard. These sturdy all-weather designs are a beautiful addition to any outdoor space. Our Stained Glass Design Specialists offer complimentary design help. Call or email for a consultation, we can help.